We offer customization on belt decoration for your company need. We can print your company name, text, logo, messages on your belts. 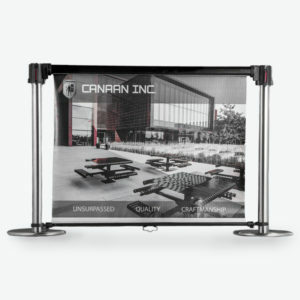 This beautiful outstanding printing can help to maximize your audiences’ visibility and guide your queue in a crowd area. Just provide us with your custom artwork, we will design a professional artwork enhances your queuing system, as well as adds a more professional image and stand out from the crowd. Please provide your artwork/logos files for printing. Accepted artwork format: pdf (high res) , ai, psd, tif, and eps. 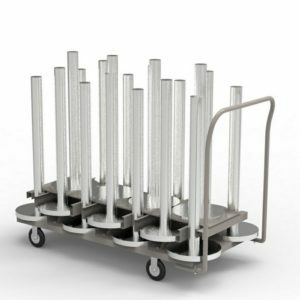 Store and transport stanchions with this handy cart! Holds up to 18 posts with industrial caster wheels and powdercoat frame. 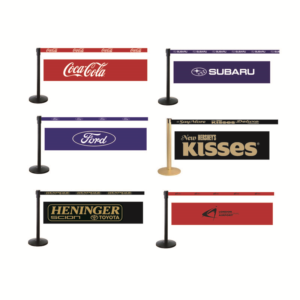 Compatible with stanchions from most manufacturer. • Available in plain black/white banners, solid black on one side and white on the other.